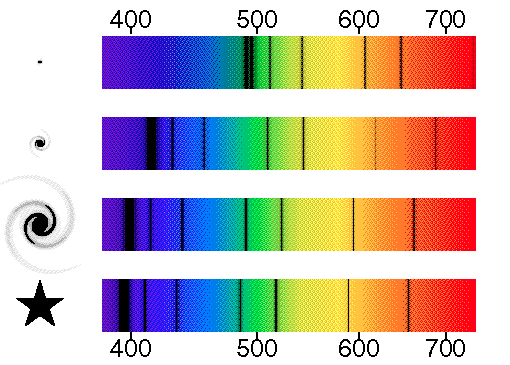 Absorption spectrums show the photons of light that are absorbed by each element. Each element has a different absorption spectrum. So to identify the elements, you have to look at the difference between different spectrums. 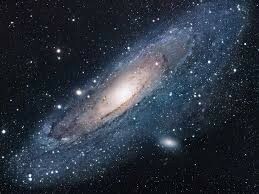 How can this help astronomers? Knowing which elements are in the stars is helpful because the spectroscopy changes when the stars are moving towards or away from the earth. The wavelengths become shorter when the stars move closer to the earth (the bands move towards blue on the spectrum) and the wavelengths become longer when the stars move away from the earth (the bands move towards the red on the spectrum). This is known as the Doppler effect. This picture displays that the placement of the bands in the spectrum are the same distance apart, so it can still show what element it is. All of the lines are shifted to the left, meaning that the wavelengths are becoming shorter, showing that its moving closer to the earth. 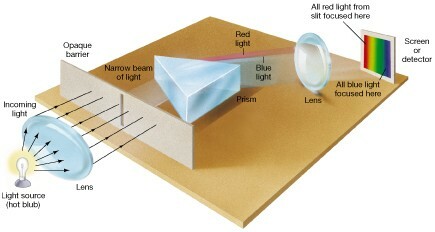 For each individual element, different photons of light are absorbed. The ones that are absorbed will show up as the black bands in the spectrum. Different elements absorb different photons of light which is why each element has its own unique spectrum.